The Romeo y Julieta Exhibicion No.4 is a rich and elegant strong Corona Extra, with 48 ring gauge, 5" (127mm) long and comes in a box of 50 cigars. It similar to the Petit Coronas from the same brand, and full of flavors. It has obviously some familiarity with the other Marevas from Romeo y Julieta. It reveals some earthy, woody aromas, and also a good amount of leather and some hints of spice on the tongue. The construction is wonderful, it is a beautiful hand rolled stogie, and the packaging, the magnificent aluminum tube, makes it a cigar that every cigar enthusiast should have in his humidor. 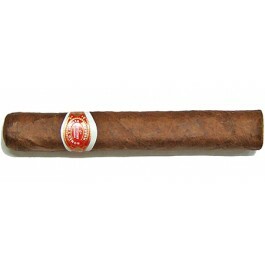 The Romeo y Julieta Exhibicion No 4 is a classic and a worldwide best seller. • Make sure to take your time with this one, and enjoy it on a full stomach. • A very equilibrated cigar offering a lot of fruited aromas and rich taste. This cigar is considered by aficionados to be a great "Robusto". The Exhibicion No.4 has a brown wrapper with a light hue. The bunch is solid around the head and the foot of the cigar and slightly looser in the middle. The triple cap is rounded and well applied. Oddly there is not much aroma to speak of. In the first third, the smoke begins with satisfying flavors of spicy cinnamon and lemon pepper. Delicious and definitely on the salty side. It is great paired with your favorite beverage. The draw is very loose and easy, which gives the cigar a spongy aspect, so that the flavors remain light and fluffy despite the spices. With this stick you get tons of billowing clouds of smoke. The second third reveals the true qualities of the Exhibición No.4. Its amazing construction still gives an easy draw, and a perfect balance of flavors. Lots of peaty aged tea. It is strong and aromatic. The final third turns out to be a bit harsher than the previous two; the cigar becomes spicier and warms up quite a bit. But there is still plenty to enjoy as a thick smoke from the spongy cigar fills your mouth, revealing the full strength of the cigar. In summary, top grade tobacco, great complexity of flavors with greatly balanced flavors of spiciness, fruits and a subtle hint of herbal notes.